What does it do, how does it work and is it worth your money. Wearable technology is being heralded as the next big thing and the big companies are competing to see who can crack the form factor first. Google continues to develop its Glass eyewear, while a handful of others try their luck with smartwatches. We don’t yet know what potential wearable tech has, but today Good Gear Guide has a look at one of the more popular renditions, the Samsung Galaxy Gear. Could this 1.9MP Android smartwatch be the thing our wrist has been longing for? The Galaxy Gear has the tough job of trying to bring technology to a form-factor that can also act as a fashion accessory — that is, a watch. On the one hand, it has to be a functional and attractive watch, but on the other hand, it has to feature a range of cutting-edge technologies. 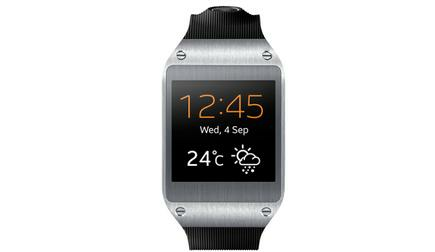 The watch face of the Galaxy Gear is a 1.63in touchscreen with a 340x340-pixel resolution. It has an understated stainless steel bezel, while the left side has the watch’s only button; a standby button. It comes with a rubber wristband that’s available in a range of bright colours, and it harbours a subtly protruding 1.9MP camera. The latch matches the stainless steel styling of the face and conceals a dual-microphone and speaker. The Galaxy Gear comes in jet black, oatmeal beige, wild orange, rose gold, lime green and mocha gray. Samsung should be commended for its design efforts. The company is one of the very few who has dared charter the unfamiliar wearable technology space, though the gear is more of a companion device than a stand-alone product. Navigating the Galaxy Gear’s menu requires you to learn a lingo of touch gestures. The gestures themselves are basic, and if you’re already used to using a touch interface, you will be able to learn the cues in a matter of minutes. Browsing the Galaxy Gear menu involves a user swiping left and right. This will allow you to scroll through a number of different applications. When you see a desired application, just tap the screen to select it. To exit the application, swipe from the top bezel downwards. If you remember these three simple steps, using the Galaxy Gear will be second-nature. There’s a fourth gesture — swiping from the bottom bezel upwards — which generates a dialler. For the dialler to function, the Galaxy Gear needs to be connected over Bluetooth to a Galaxy Note III, a Galaxy S4, or a Galaxy Note 10.1 4G. Once connected, you can use the Galaxy Gear as a Bluetooth speakerphone to make phone calls. The dialler links with your supported Galaxy device for smart dialling. Does it work with smartphones? Samsung is using the Galaxy Gear to strengthen its device ecosystem by limiting compatibility to its own Galaxy Note III, Galaxy S4, and galaxy 10.1 4G devices. This means the Galaxy Gear won’t work with Android devices from other manufacturers. The Galaxy Gear connects to your smartphone over Bluetooth, but to streamline the pairing process, Samsung makes use of tap-to-connect near field communications (NFC) technology. When you first power on the Galaxy Gear, an animation instructs you to tap the Galaxy Gear’s charging base against your compatible Galaxy smartphone. The entire process is guided by on-screen prompts displayed on your Galaxy smartphone. 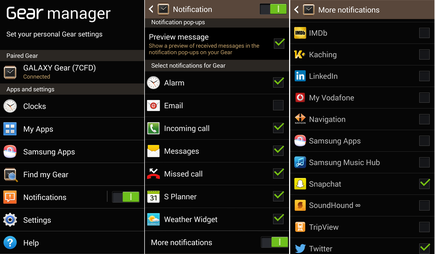 Immediately after pairing, your Galaxy smartphone will download the Gear Manager application; an Android application that makes it possible to configure the settings on the Galaxy Gear. The Galaxy Gear will automatically connect to previously paired devices when they are in range. The connection has a range of approximately 15m (it disconnected when we ventured further) and it will continue to operate even if you enter another room. If it does disconnect, the Galaxy Gear will automatically reconnect once it’s within range again. The primary functions of the Galaxy Gear are to tell the time and feed notifications from your smartphone to its 1.63in screen. By default, messages and calls are enabled, but it is easy enough to enable notifications from the vast majority of third-party apps installed on your smartphone. The Galaxy Gear will display these notifications as bodies of text rather than the actual application. This is because it would not be practical to display apps on such a small screen. The onboard speaker and dual microphone make it possible for the Galaxy Gear to be used as a speakerphone. The only downside is people can hear your conversation, and speaking into your wrist isn’t a flattering look. The Galaxy Gear can process voice commands by working with your smartphone’s S-Voice personal assistant. It can also be used as a recorder of voice memos. Those of you content with 1.9MP photos and 720p video recordings can make use of the Galaxy Gear’s camera capabilities. The quality of the camera is best compared to the front-facing cameras found on contemporary smartphones. Sneaky photos can inconspicuously be snapped with the Galaxy Gear as the camera is located on the wristband, though to alleviate privacy concerns, the shutter will always make a noise. To conserve space, video recordings are limited to 15 seconds and all multimedia is automatically backed up to your connected smartphone’s storage. A practical inclusion is the on-board pedometer. It continues to record the number of steps taken in the background while other applications are in use. Samsung could make the Galaxy Gear more attractive by adding in-built GPS as it would give the smartwatch credibility as a sporting companion. What is inside the Galaxy Gear? Just how clever the design of the Galaxy Gear is becomes obvious once you realise what hardware is inside that slim body. Nestling beneath the 1.63in, 340x340-pixel resolution touchscreen is an 800MHz CPU, 512MB of RAM and 4GB of internal storage. The wristband is designed just as cleverly as it harbours a 1.9MP camera capable of recording video at 720p resolution, in addition to a dual-microphone and a loudspeaker. This hardware capably runs the Galaxy Gear’s Android-based operating system, which has been heavily revamped to accommodate the smartwatch form. It’s unfortunate Samsung has monopolised the Galaxy Gear by making it compatible only with its own branded devices. By not supporting additional Android manufacturers, the company limits the number of people who would support the development of the Galaxy Gear smartwatch. When will I need to charge it? Placing a charging port on a smartwatch would discount its style and take up valuable space. Samsung has circumvented this problem by placing charging contacts on the base of the Galaxy Gear and including a unique snap-to-close charging cover. Even the charging base is good looking. The charging cover features a generic micro-USB port on its back for power, and it’s also equipped with the NFC technology needed for pairing the device with your Galaxy smartphone. In our tests, we found that the Galaxy Gear held a charge for three to four days with regular use, which included receiving notifications from third-party applications, intermittent speakerphone usage and a little camera usage. A full charge took approximately ninety minutes. Samsung has done a stellar job at trying to define what a smartwatch should do, but there is still room for improvement. The Galaxy Gear manages to combine impressive hardware into the form-factor of a watch, and its heavily refined version of Android works ideally with the limited screen real-estate. An in-built GPS receiver is something the Galaxy Gear would benefit from as it would make the smartwatch appealing to those of you who are health-oriented users, and also give it more credibility as a stand-alone device. The camera, although functional, is superfluous when you consider your smartphone is just at arm’s length. It’s also difficult framing a photo and video with a camera that is mounted to your wrist. The Galaxy Gear is a nice device to have, but unlike a notebook or a smartphone, it doesn’t cater to a specific need. If you invest in a Galaxy Gear now it would be purely for the gimmick. Hopefully over time Samsung — and other manufacturers — will identify what role smartwatch technology can play.